It is handmade in Germany and can be used in a variety of ways and is also very variable adjustable. 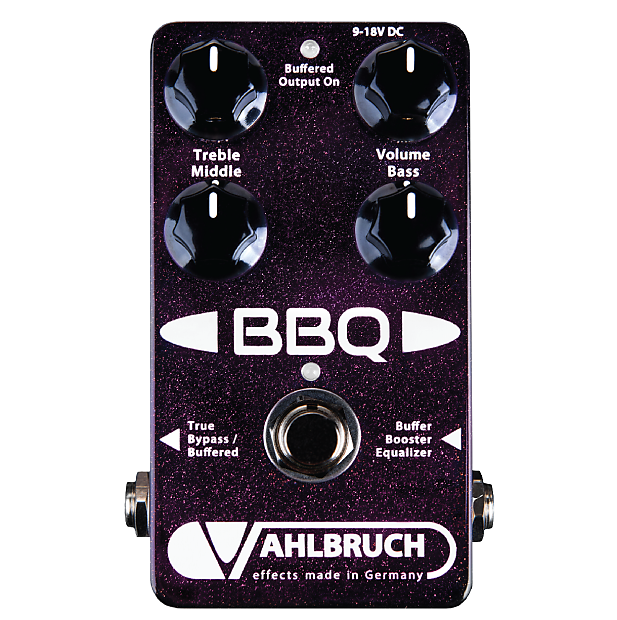 The BBQ pedal can be placed in front of the amplifier or in effect loops. It is perfectly suited as a booster to push the amp harder, it can help to clear up a crunchy amp, it helps to adjust different guitars to an amplifier, it eliminates impedance adjustment problems and it prevents your tone over long cables and effect chains. The operation is very easy and self-explanatory. A small plug' n' play secret weapon! The BBQ pedal is also suitable for acoustic guitars! An internal switch can be used to select between a true bypass mode or a permanently active high-end buffer circuit. An LED indicates the activated buffer mode as "Buffered Output On". An active 3-band equalizer provides a wide range of +/-15dB for a precise and musical adjustment of bass, middle and treble. The individual frequency bands do not influence each other. The volume can be adjusted from -8dB to +16dB in a wide and practical range. Newly developed and very low-noise circuit design. Exceptional reliability and ease of maintenance thanks to careful free wiring of jacks and foot switch. Robust "on/off" circuit, an orange LED indicates the status.